Moved to WordPress and new domain! This blog was hacked again and the database taken down. As this is no longer my primary blog (and I post here infrequently now) I decided the best course of action would be to simply take it off my server and give it to WordPress.com to host (the chances of it being hacked there are remote!). I have wanted to change the domain of the blog for quite some time as well so I decided to combine the two jobs into one. I already owned TomRaftery.com and it was doing nothing so I decided to use this as it is a more appropriate url for the site. 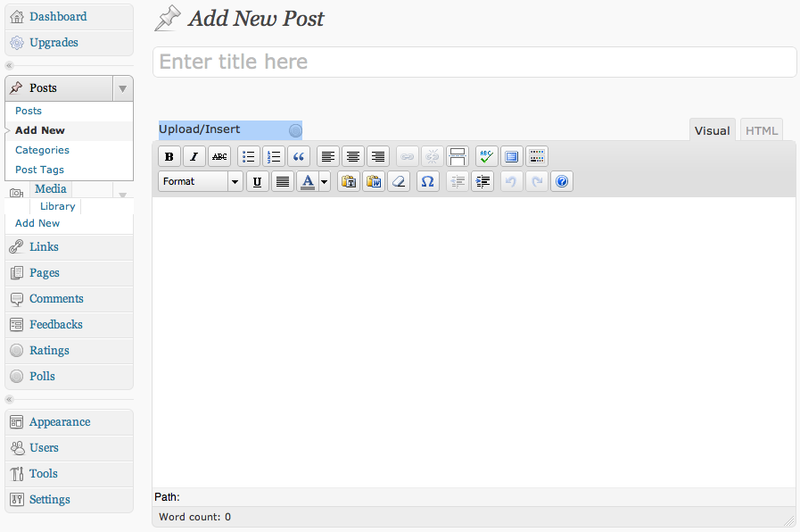 To upload the site to WordPress.com I first created a blank WordPress.com blog (simply by signing up and verifying email – a 2 second job). Then I went to my old site and created an export file (Tools -> Export) – this downloaded a 24mb xml file to my computer. 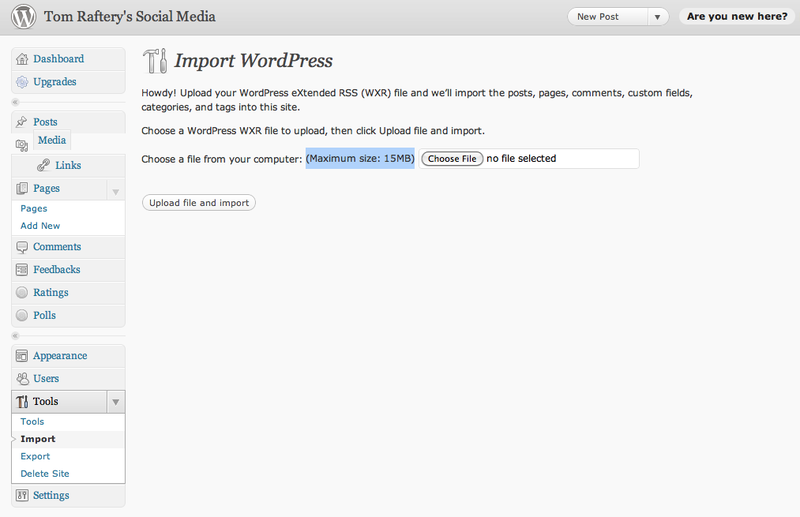 When I went to the WordPress.com to do the import I spotted that the Import message read “Choose a file from your computer: (Maximum size: 15mb)”. Oops! – this was going to be an issue. I thought about going into the xml file and manually editing it but when I opened it I saw it was over 400,000 lines long and I really didn’t want to mess it up so I thought again. I checked the spam list on the site and I saw there were thousands of spam comments in there. What if I deleted them and tried again? I did and sure enough this knocked the xml file size down to 17mb – an improvement but still too large to import. What to do? Then I had a brainwave (should have been obvious really) – what if I split the export into two files? So I tried it, I first exported all blog posts up until December 2006 and then I did another export of all the blog posts from January 2007 until the most recent post (November 2010). This created two files of less than 15mb each which could now be imported. 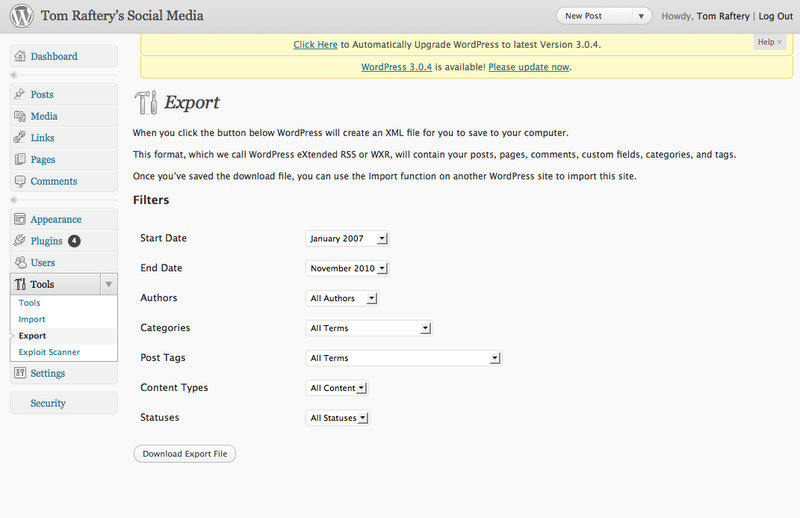 Would WordPress.com allow me to import two files totaling more than 15mb? I didn’t know but figured it couldn’t hurt to try, so try I did and it worked a treat! Now that all my blog posts (and their associated comments, categories, tags, etc) were imported the next step was to associate it with the TomRaftery.com domain. This required me to update the nameservers for the domain to point to WordPress nameservers (after paying for the domain pointing service from WordPress). 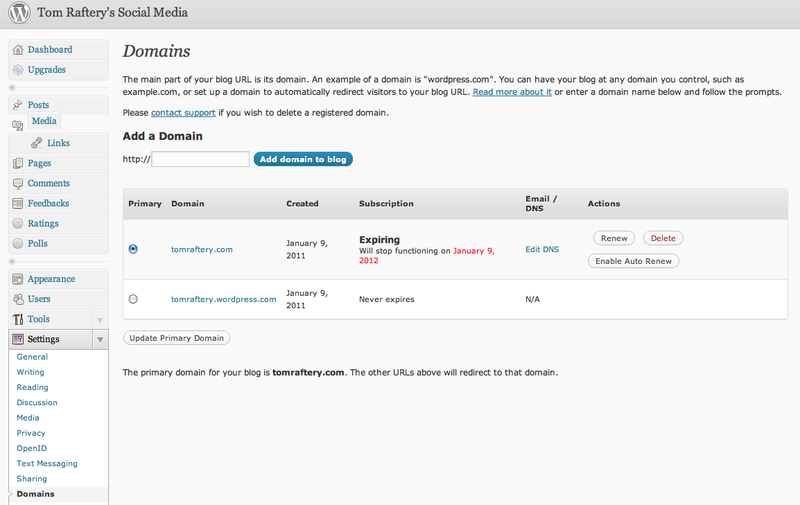 Then I had to set it as the primary domain for the site (see below). The last step was to go back to the old TomRafteryit.net domain and set a permanent (301) re-direct on it so that people (and search engines) would be re-directed over here to the new TomRaftery.com domain – now safely hosted on WordPress.com servers. So here we are. If you are reading this – welcome to the old blog on this new site. Thanks for taking the time and hopefully I won’t leave it so long to the next post! WordPress launched it’s long anticipated WordPress app for the iPhone and iPod Touch this morning. See http://iPhone.wordpress.org for more. I downloaded to my iPod and am writing this post using it. The write screen seems quite bare. I don’t yet see how to add links, emphasis or photos to posts. I am sure the functionality is there I just need to look around more. Ok there was some kind of bug when I was using this first and the bottom Menu bar was missing. I hit the Home button quitting out of the app and opened it again. This notified me that it had recovered a post (good, I thought I would lose it when I quit). Opening the post now displays the bottom menu so I don’t know what caused the bug or if it will recur. 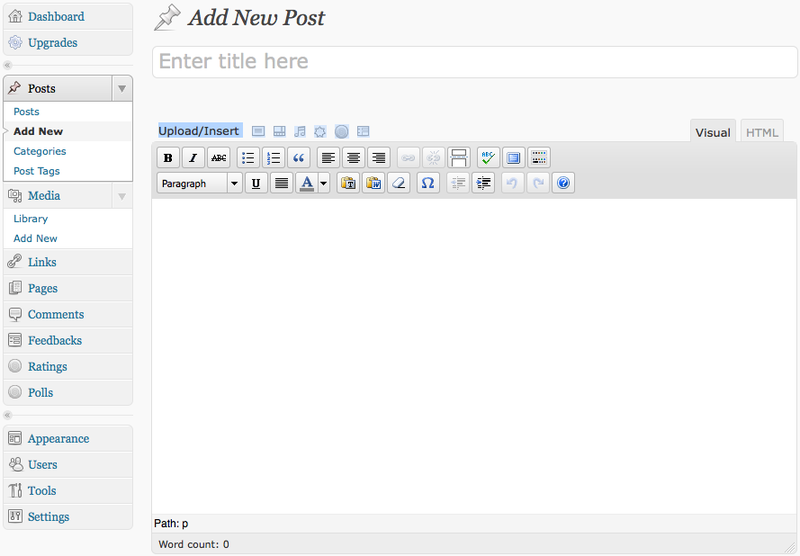 I still don’t see an easy way to create links in blog posts. 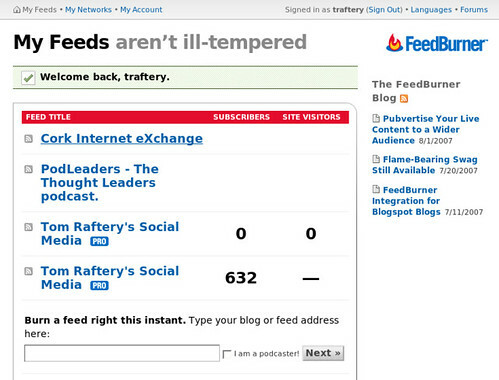 Adding multiple blogs is easy. The hardest part (for me) was being able to remember the passwords! It is a free download. And they say it will be open source. Not sure where to download the code from yet. Will update this post as soon as I find out. The main reason I use it is to simply populate the posts with a Flash player for any podcasts which I post so people can listen to them onscreen. However, since upgrading PodLeaders to WordPress to 2.5 the plugin has stopped working 😦 It simply displays a blank where the Flash player should be. I tried switching to the Default WordPress theme to see if the problem was theme related but it appears not to be as the problem also happened in that theme. 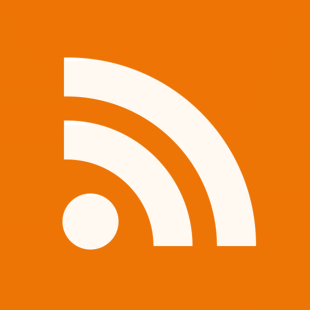 I downloaded another plugin, called Podcasting which is supposed to work with WordPress 2.5 but that didn’t seem to work either. Does anyone have any idea where the problem might lie and what I’ll need to do to fix it? UPDATE: Problem solved. Pete reminded me in the comments of this post to check my folder structure for the Audio Player plugin and sure enough when updating from 1.2.2 to 1.2.3 I had inadvertently uploaded the plugin folder instead of simply the contents of the plugin folder! Fixed now and working once more. Thanks Pete. I read Matt’s post about the release of a beta version of WordPress 2.5 this morning with great excitement (sad aren’t I?) and immediately downloaded it. The screenshots Matt put up look great and I can’t wait to try it out. However, then I had a rare moment of clarity. Waaaait a sec Tom. Let’s not go breaking the site just yet. Often blog software updates break plugins and occasionally themes. I certainly had difficulties with this site the last time I upgraded. Let’s not repeat that again in a hurry. SO if anyone has tried out WordPress 2.5, how is it looking, what are the gotchas and how soon will a painless upgrade be viable?